People with missing teeth have more replacement options than ever before, including the ever popular but often more expensive dental implant. But there has also been an expansion of choice on the more affordable side of dental restorations. The flexible removable partial denture (RPD) is one such choice. Though RPDs have been around for some time, the newer flexible RPD offers some advantages over the more rigid traditional RPD. They’re made of a kind of nylon that’s pliable but also strong and durable. This material is thermoplastic, meaning when heated it can be injected into molds based on a patient’s individual mouth to form an accurate denture base. The gum-colored base can also be formed to cover any receded areas of the gums, which can greatly improve smile appearance. Older versions of RPDs are made of rigid acrylic plastic that stay in place in the mouth with metal clasps that attach to remaining teeth. The flexible RPD, on the other hand, is secured with finger-like nylon extensions that fit and hold in the natural teeth’s concavities near the gum line. This, along with its relatively light weight, offers a more comfortable fit. But aside from these benefits, flexible RPDs do have a few drawbacks. 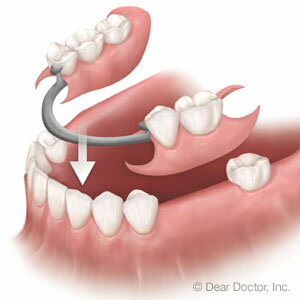 Although fracture-resistant, they’re not easy to repair or reline to readjust the fit to accommodate mouth changes. They can stain (though not as much as a traditional RPD), so they require diligent cleaning and maintenance. We consider the whole category of RPDs as “temporary” restorations, meaning they’re intended as a transitional phase between tooth loss and a permanent restoration like a natural tooth-supported fixed bridge or dental implants. For some, however, the flexible RPD might be a more long-term solution. As mentioned before, to extend their life as much as possible they should be removed daily and cleaned thoroughly. And like any form of denture, they should not be worn overnight. In either case, flexible RPDs offer an effective way to restore not only dental function diminished by missing teeth but an improved appearance as well. With careful maintenance, they could serve you well for some time to come.